Cut with the mother rock intact, each stone's shape conforms to the shape of the rough. Therefore, each boulder opal's charm lies in its unique shape and brilliance. The dictionary defines the word boulder as "a large, rounded stone. "This type of opal is called "boulder opal" because it is found in the ironstone boulders mined in the state of Queensland, Australia. Boulder opal forms as layers within the mother rock (matrix) and is polished with this matrix attached. There are "full-face" pieces that have opal on the entire surface, and "partial-face" opals that show patches of mother rock when viewed face-up. Opal has been mined since the beginning of the 20th century in and around the three localities of Yowah, Quilpie, and Winton in the state of Queensland. At first, the opal portions were generally removed from the matrix and polished. Since the 1960s, however, the previously discarded portions containing opal have been polished with the matrix intact, resulting in boulder opal. Since the 1980s, pieces have been polished to follow the shape of the mother rock, creating gems of various shape and thickness. In a way, the transition to boulder opal symbolizes the exhaustion of gemstone resources. When a cutter polishes a boulder opal, it is given a free-form shape to preserve as much of the opal as possible while using the mother rock effectively. On rare occasions, stones are repolished into standard shapes such as ovals. The boulder opal as shown in the photograph on the next page is a full-face opal with a flat surface that exhibits distinct patches of colors. 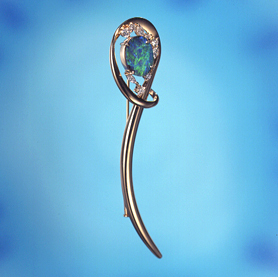 This is called the "play-of-color" effect, and it is the key factor in the quality of an opal. Each piece's unique form and brilliant colors create the charm of boulder opal. Some Mexican opals and light opals with high water content may develop cracks if they dry out, but boulder opals rarely have such problems. Opals are fragile, however, and care must be taken not to strike them against hard surfaces. Also, assembled imitations such as opal doublets and triplets are often sold as boulder opal, making it important to choose your opal from a reliable jeweler.